ENERGY STAR has become a powerful platform for improving the environment through energy efficiency. ENERGY STAR is more than a label awarded for energy efficiency. It is a partnership among government, business, and consumers, united in the pursuit of a common goal—to protect our environment for future generations. The ENERGY STAR program has been a resounding success over the last decade. Americans have purchased more than 1 billion ENERGY STAR qualified products and thousands of buildings have been improved. More than 7,000 businesses and organizations have become partners, and more than 40% of the American public recognizes the ENERGY STAR. Last year alone, with the help of ENERGY STAR, Americans saved the energy required to power 15 million homes and reduced air pollution equivalent to taking 14 million cars off the road—all this while saving $7 billion on energy bills. To learn more about ENERGY STAR Labeled Roof Products, go to http://www.energystar.gov. 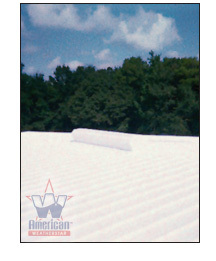 To learn more about American WeatherStar Roof Products, go to http://www.americanweatherstar.com. Want to learn more about the impact our ENERGY STAR qualified roofing products can have on your facility and your bottomline? Can Acrylic Coatings Save Your Next Roof?